With South Africa’s signature, the Tripartite Free Trade Area appears liklely to provide a transformative future for the continent. Mauritius is already predicting billions of dollars of high-impact investment. Last year, Africa rallied a kind of unified political will that was never seen before. 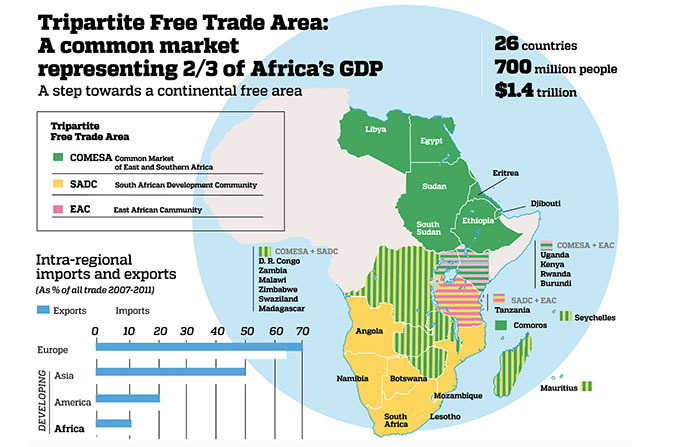 Of 55 African nations, 44 signed the African Continental Free Trade Area (AfCFTA), a pact so large that if ratified it would become one of the world’s largest free zones since the creation of the WTO in 1995. The agreement would cut 90% of tariffs on all goods, with the aim of increasing intra-regional African trade. However, there was a major hold up: two of the 11 countries missing are South Africa and Nigeria, which together constitute one-third of Africa’s GDP and 20% of its population. Offering an alternative pact cutting 85% to 90% of tariffs, the Tripartite Free Trade Area (TFTA) would unify 26 countries, representing 700 million and $1.4 trillion (equal to 66% of Africa’s total economic output), according to organizing leader, the Common Market for Eastern and Southern Africa (COMESA). Based in Zambia – a country that declined to sign the AfCFTA – COMESA and is approaching closure for the TFTA, which underscores “industrialization and infrastructure development” for three African economic blocs: the East Africa Community (EAC), the Southern African Development Community (SADC) and COMESA (see map). Crucially, the TFTA includes a signature from South Africa and at time of writing only two countries have yet to sign – South Sudan and Eretria. The inclusion of South Africa gives the TFTA a real shot at being a historically transformative force on a continent that is the global laggard in intra-regional trade. Of Africa’s total exports, only 11% between African nations, as opposed to 21% in Latin America, 50% in developing Asia and 70% in Europe (see chart). When the TFTA is opened, regional leaders predict a windfall of investment will follow tariff-relieved trade routes. With this backdrop, Mauritius is planning to cash in on its reputation as an African business leader to funnel in new investments. “Our role in Mauritius is clear: to leverage our competitiveness, status as safe investment destination, and efficient financial sector to channel investments. What we give as security no one else can,” asserts Mr. Lutchmeenaraidoo.